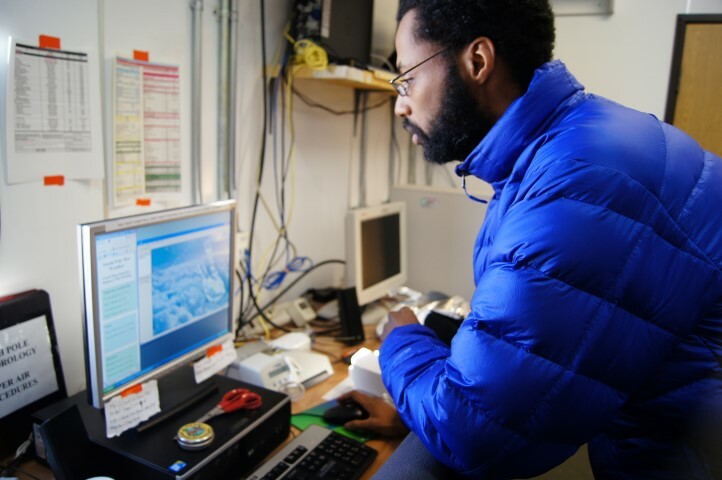 Photo Credit: Elaine Hood/Antarctic Photo Library Phillip Marzette, South Pole meteorologist, uses a computer to prepare a radiosonde for launch aboard a weather balloon. Weather at the South Pole has had plenty of ups and downs this winter, and set a new record high for the month of June. The wild winter weather continued at the South Pole through June, as more temperature and wind records fell as the research station passed the midwinter hump. Each event involved storms that moved moisture, clouds and winds from the Weddell, Bellingshausen and Amundsen seas over to South Pole that warmed up the temperatures significantly. For instance, on June 2, the temperature hit minus 22.2 degrees Fahrenheit (minus 30.1 degrees Celsius), setting the all-time maximum temperature record for the month of June. The previous record high of minus 23.6F (minus 30.9C) occurred on both June 14, 1963 and June 1, 1993. It turns out that the new June record barely lasted two weeks. 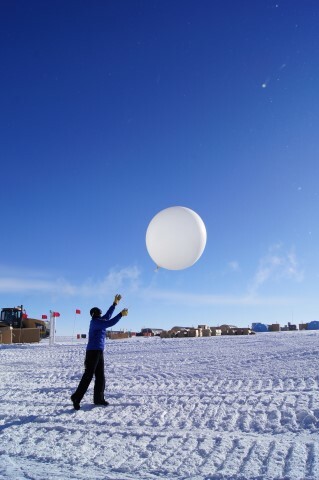 South Pole meteorologist Philip Marzette launches a weather balloon at the South Pole during the summer. On June 19, the temperature climbed to minus 19.8F (minus 28.8C). The record-setting day was bookended by two single day maximum temperature records. June 18 reached minus 33.2F (minus 36.2C), which broke the previous maximum temperature record of minus 39.1F (minus 39.5C) set in 1997. And the high of minus 32.6F (minus 35.9C) beat out the previous maximum temperature record from 1961 of minus 34.6F (minus 37.0C). “The June 19th temp was due to those same moisture waves that happened earlier in the month,” explained Phillip Marzette, senior meteorologist at the South Pole Station , via e-mail. “It looks like the weather can still take a jump, even after the article has been written,” he quipped. Record-setting winds also accompanied the record high temperatures. Beginning on June 17, the peak wind clocked in at 51 miles per hour (44 knots), well outpacing the 2009 record of 40mph (35 knots). The next day, June 18, the wind speed peaked at 46mph (40 knots), blowing down the 1990 record of 39mph (34 knots). Finally, on June 19, the peak wind speed reached 43 mph (37 knots), which tied the previous peak wind speed record set in 2001. The June 19 temperature record represents the warmest day in a South Pole winter from the months May through September, according to a record of maximum temperatures published in a 2012 paper called “Fifty-year Amundsen–Scott South Pole station surface climatology” in the journal Atmospheric Research by Matthew Lazzara , et. al. But June wasn’t done just yet. A final daily maximum temperature record fell on June 28 when the mercury climbed to minus 41.6F (minus 40.9C), edging out the previous record of minus 43.2F (minus 41.8C), set in 2001. “The last week of June had more ‘normal’ conditions, as far as temperatures and winds, not too bitterly cold,” Marzette reported. “It seemed reminiscent of a summer-type of pattern, where we have cloudy and windy conditions about once every three days, while the rest of the time, conditions were clearer, cooler and lighter winds. “This trend has continued on over to the first part July for the most part, only a bit windier than normal,” he said.